When you think about marketing your business, what comes to mind? Most would say that marketing is meant to increase revenue. While increased revenue is an obvious end goal, there is another potentially more important purpose, one that may give you a new insight into your marketing strategy. What am I talking about? Increasing your share of the market. Whether your business is local, regional, or national, you should always look at the ways you can increase your share of the marketplace. Why? Simply, it helps your business grow. And having an effective marketing strategy in place can help you do this. A well executed marketing strategy not only increases your revenue, but also allows you to increase your share of the market. Here is how your business can benefit from a larger share of the marketplace. Box out your competition – as your share of the marketplace grows, the inverse happens to your competition. They will find it harder to find and keep customers because you are getting all the attention. Additionally, you create a higher barrier of entry for any new competitors. Increase your influence – the more attention your business gets, the more influence you will have over the marketplace. In time, both customers and competitors will look to you for needs relating, to your industry. Stay ahead of your industry – as you develop content you will learn more about your business and the industry you are in. This will give your organization valuable insights into future trends, giving you an even greater advantage over your competition. Focus on the needs of your audience – another byproduct of developing content is increased engagement from your audience. This engagement lets you know more about them, their pain points, and the best way to address them. Over time, the connection to your target audience will grow stronger and deeper, leading to further leads and potential customers. These benefits result in increased opportunities to grow your business and set your organization up for a bright future! 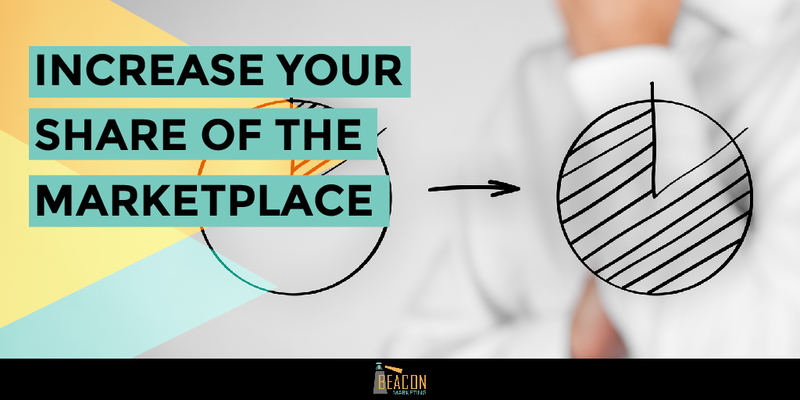 Schedule a FREE 60 minute consultation to find out how Beacon Marketing can help you increase your share of the market! Finding success in marketing can take time. In the beginning you may fail more than you succeed. To keep going you have to have the right mindset. If you engage in marketing activities with the sole purpose of increasing revenue, you may get discouraged when you don’t see immediate returns. However, if you have the mindset of increasing your share of the marketplace, then you will be more patient with the investment you are making.